Since the beginning of climate change legislation this session in Congress, it has been clear that big agriculture would not be a part of a cap and trade program. Yet, while the Waxman Markey bill has been making its way through Congress, the EPA has also been pushing forward its own agenda of climate related regulations, including the mandatory reporting of GHG emissions from factory farms. Yet, yesterday the House Appropriations Committee undermined this progressive proposed regulation by passing the 2010 Interior and Environment spending bill. An amendment in the bill will prevent the EPA from requiring factory farms to report their GHG emissions - a move that represents a blatant handout to large factory farms. While climate legislation stalls through Congress, the EPA proposed rule aims to establish at least the basis for regulating GHG emissions- knowing how many we produce and where they come from. Two weeks ago the comment period ended for the Proposed Mandatory GHG Reporting Rule, which would require American industries to report their GHG emissions, over a threshold of 25,000 tons. Among the highlights of the proposed rule was the requirement that manure management be considered a reporting category. As such, large scale concentrated animal feeding operations (CAFOs) more commonly known as factory farms, would be required to report their emissions if they reached the 25,000 ton threshold. According to the EPA the number of CAFOs in the U.S. that reached this amount was only around 50 of the largest, most intensive facilities in the country. There have been a lot of questions floating around as to why Americans should care about livestock poop, particularly in the context of climate change and GHG emissions. While it is little discussed, it is actually quite a significant contributor to GHG emissions. First and foremost- animal manure and livestock produce methane and nitrous oxide, which are about 23 and 300 times respectively stronger than carbon dioxide. According to the EPA GHG Inventory, manure is the 5th largest source of methane and the 4th largest source of nitrous oxide in the U.S. It results in more GHG emissions per year than all cement production and more than twice as many emissions as waste incineration and natural gas systems in the U.S. It should also be mentioned that enteric fermentation-gases produced from livestock-is the number one source of methane emissions in the U.S. Combined, manure and enteric fermentation produce about as many GHG emissions as the entire commercial sector's burning of fossil fuel in the United States. The EPA did not require that enteric fermentation be considered a reporting category in their proposed rule. The way in which CAFOs pool their manure together is a large part of the problem here. 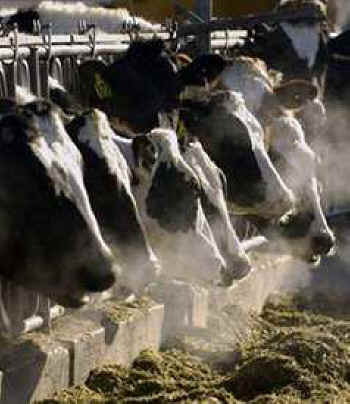 When stored in pits and lagoons as is typical on factory farms, the manure breaks down anaerobically, in the absence of oxygen, which exacerbates methane emissions. The EPA has acknowledged that when manures are distributed on pastures as would be typical in a grass-fed animal system, methane production is limited. Thus, there are proven ways to reduce methane emissions in manure management. But with the passage of the House Appropriations amendment last night, there may not even be the chance to attempt to reduce GHG emissions from factory farms. Representative Dicks (D-WA) stated, "A facility of that magnitude and size can well afford to at least report in what the level of methane is," Dicks said. "I think this is something we need to know. Methane is one of the most important gases that we have to deal with if we're going to deal with this issue." Well said. By preventing the EPA from collecting data from manure systems, the House Appropriations committee is telling the American people that they aren't serious about climate change or the health of rural communities and farmworkers, who must live with terrible odors and noxious gases associated with such facilities. What is especially disheartening about the move is that it would prevent a much needed better understanding of livestock and manure emissions that would help foster scientific research and effective methods for reducing such emissions. If Congress is serious about climate change then we need the data to understand our emissions, which will only happen for livestock and manure if the amendment is removed before the final version of the bill. Meredith Niles is coordinator of the Cool Foods campaign at the Center for Food Safety. The Cool Foods Campaign is a national public advocacy, education and policy campaign to reduce greenhouse gas emissions in our food and agriculture systems. The Campaign is working with a variety of organizations, businesses, schools, restaurants, city councils and individuals to help reduce "foodprints." The Campaign is also working on climate change and agriculture policies that will promote the reduction of greenhouse gas emissions from industrial agriculture in our food system, and reward small-scale sustainable farmers for their positive contribution to climate change mitigation.